This tool of Hyper allows direct access to all of Hyper tables, in order to manage the data and execute the following actions: Import / Export data, Edit / Fix data, Move data and delete data from tables. All of the actions and available modifications of this tool, are available for the system administrator only (Administrator authorization). Hyper Tables - This section displays all of Hyper tables. Records Filter - This section displays all of the selected table's fields, and allows to fill in required filters for each field. Query results table - This table displays the search results, according to the required filters. The data in the results table can be modified according to the organization requirements and rules. Table Name The Hyper table name. Store on One File Describes whether this table has more than a single primary key. For example: the Tax_Invoice table has a single primary key (Invoice Number). Tax_Invoice_Items table has two primary keys (Invoice Number, Item ID). Protected - These tables can not be edited. Also, the field of these tables can not be saved / moved / deleted. In order to modify these tables, contact SYE support team. Edit Only - The values of this table's fields can be modified. The tables definitions can not be changed. Read Only - This protection level allows to define the fields but does not allow to modify the fields values. Edit & Rules - This protection level allows to define the table's fields and modify their values. Query Data From - In these check boxes, mark the required data sources: Current Folder / Archive Folder / Deleted Folder. Save Data To - Select the required table to save the modified data to: Current Folder / Archive Folder. 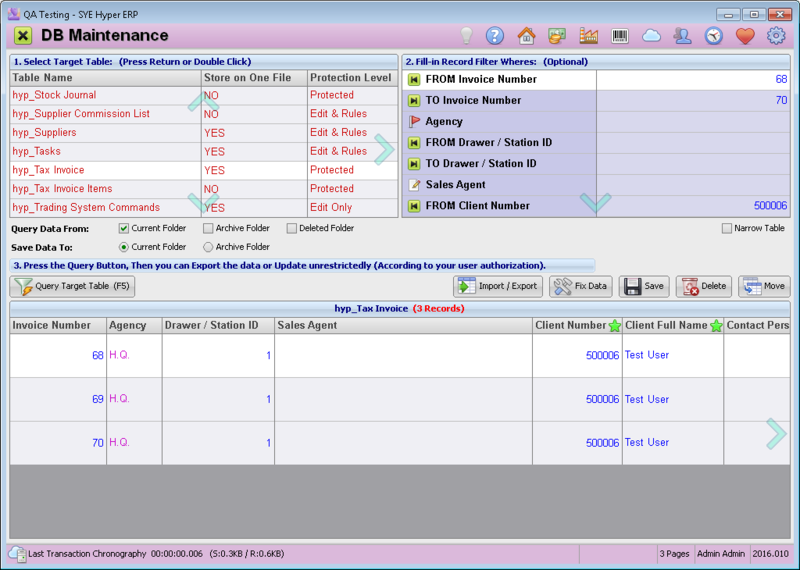 Narrow Table - This option was designed to simplify the data modifications. After marking this check box, a window with the list of the table's field will be displayed. For tables with a wide data base and fields, use this option to display only the required fields. Use the right click menu to delete / add fields to the list. to approve the final list of required fields, press the Save Settings (F6) button. After choosing the required table and filter fields, press the Query Target Table (F5) button. Create an Excel file, with the required fields values. It is recommended to use the same fields titles as in Hyper tables. Copy the values table from the file (Ctrl+C). Press the Paste from Clipboard button. 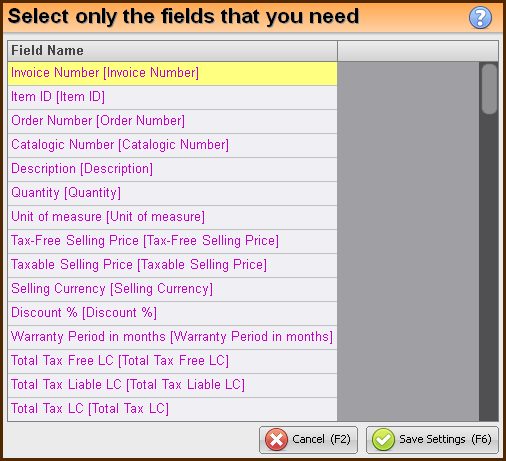 In order to match the imported fields values with Hyper fields, press the Copy Column to Target Table (F5) button. This button opens the "Copy Column to Target Table" window. Please note - this action refers to the selected column only. In this window, select the target table's required field, for the selected imported column values. The "source Field" displays the selected imported field title. In the "Copy Column to Target Table" field, select the Target Hyper field to refer the imported values to. The new values will be instantly added to the selected table. Load Hyper data file, from the local computer. Save the selected table's data to clipboard (Ctrl+C) and allow to paste it (Ctrl+V) in an Excel file. Export the selected table's data to Excel file. Save the data on the local computer, as Hyper file. After saving the data, it can be loaded by using the Load Data from DB Binary File button. Fix Column Mask Adjust the field values to its defined mask (format). Auto Number (Integer) Selected Rows. Auto number the records. In the opened window fill in the required number, to start the auto numbering from. Auto ID by Datetime on Selected Rows Create an auto ID according to the time stamp of the action. Leave Duplicated records by the Selected Columns Use this tool to filter duplicated records. Select the required column and press this button. The system will display the exist records with same values in the selected field. Save Records - save the modifications. The system scans all of the records and updates the data according to the modifications. Please note - This action replaces any previous data of the modified records. Append Records - Append the records to the exist data. This action appends the data according to the primary key and does not check whether this primary key already exists. Therefore, it is the system admin responsibility to verify it before using this option. Use this option in one of the following cases: empty table (no records), or alternatively if the system admin knows for certain that these primary keys do not exist. This action spares the need of the system to scan all of the exist records. The system admin will be asked to approve it again. Please note - The data will be saved to the selected folder: Current / Archive. Delete - delete the selected row from the table. In the "From Folder" field, select the folder to take the data from. In the "To Folder" field, select the folder to move the data to. N - The current folder. A - The archive folder. D - The deleted data folder. To approve this action, press the OK (F6).